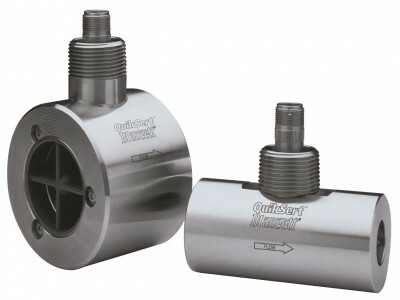 The QuikSert® in-line turbine flow meter's durable stainless steel housing incorporates a helical turbine with tungsten carbide shaft and bearings. The turbine provides an efficient, long Service life and a cost effective solution for most measurement requirements. The QuikSert's compact design requires less space in the flow line, allowing easy installation and lower mechanical costs. The QuikSert® utilizes modified upstream and downstream flow straighteners for enhanced fluid dynamics. QuikSert® provides a local flow rate and volume totalization when used with a display such as the Blancett® B3000. Bore sizes from 3/8" to 1"
Bore sizes from 1/2" to 2"